This poetic picture book is a meditation on the ways in which kids are connected to nature through sweat, tears, air, and atoms. This is a strange but beautiful book. The pictures resemble dioramas, as they combine paper cut-outs, string, and three-dimensional objects to create various scenes. It’s not always clear what each image is actually meant to depict, but this adds to the dreamlike quality of the poetic text. The best pictures in the entire book are the one about breathing, where the trees seem to lean against an unseen breeze while rabbits fall gently from the sky, and the one about sneezing and brain electricity, where kids stand on blue and purple clouds and throw lightning bolts against a pitch-black background. Though there is little explanation of either image in the text, both are perfectly suited to what is being discussed on their pages. Also wonderful is the image of the little girl standing with a hand above her head as though guessing how tall she might grow in the future. 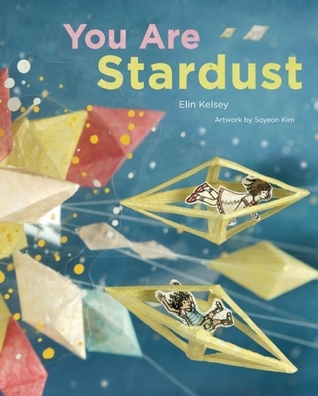 Readers who enjoyed All the World might also like You Are Stardust. This is the kind of picture book that can also be given to older kids, and even to adults, as a gift. Though I can’t really think of a specific child I would suggest this book to, I do like it and I might have to spend some more time with it before I can think of more ways to share it with others.